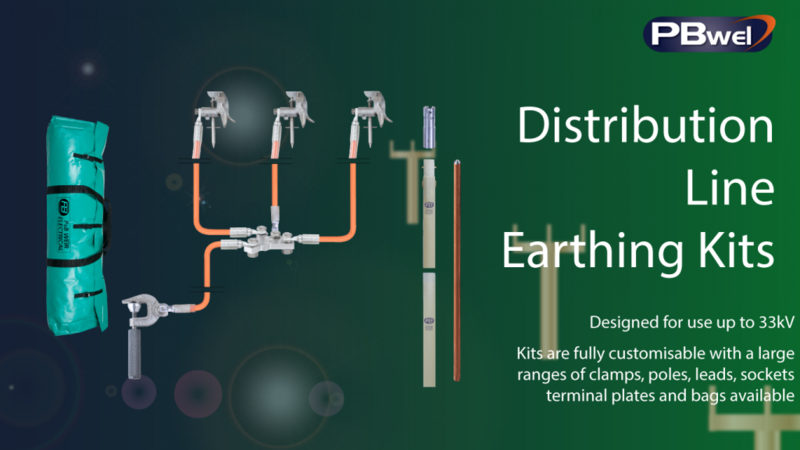 P&B Weir Electrical Ltd offer a range of Distribution Line Earthing kits for 11kV-33kV and we can create Distribution Line Earthing kits to suit specific requirements. The major components consist of line end clamps, phase leads made from aluminum aluflex or copper conductors, pole mounted cluster bar and terminal plates, down leads, earth rods and earth end clamps. These are fitted to a conductor using operating poles and operating sockets, all of which can be held in a range of carry bags for ease of transportation. The two major line end clamps are the S9B range which operates as a’ hook on ‘and ‘screw up’ style and the CE62 which is a quick snap on and release version. A down lead connected to an earth end clamp then connects to a copper clad earth rod or to an earth point. Both Terminal plates and Cluster Bar arrangements are available depending upon customer preference. Earth nest kits are also available- the kit contains four 850mm copper bonded earth rods connected to four 50 sq. mm aluflex leads and brass spilt connectors which connect to a terminal plate. Long standing service to DNO’s. Kits can be fully bespoke to suit customers’ requirements.